This Lemon Curd recipe (printable version is at the bottom of the post) is one of our favorite toppings for our homemade yogurt! We often have it for an after dinner treat. If you have ever had Ellenos Greek yogurt with lemon curd, this tastes exactly like it. It is also nice to drizzle this lemon curd on pancakes or waffles, or use it anywhere else you would use a lemon curd. Save those leftover egg whites for souffles! As a bonus, it is a tasty way to get some important nutrition. Indulge me while I break down the ingredients for you. This lemon curd does not use sugar like a conventional recipe. We all have heard the dangers of processed sugar, right? Because refined sugar is an “empty” food, your body has to steal nutrients from itself to process the sugar. However, using a combination of honey and maple syrup gives this recipe some sweetness while actually adding some nutrients to help your body process them. Specifically, maple syrup contains trace minerals. and honey contains antioxidants, vitamins and minerals. Wash and zest the lemons and then juice them. 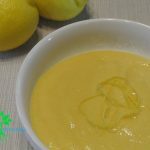 In a heat-proof mixing bowl (or a double boiler), mix the egg yolks, lemon juice and chopped zest, honey, maple syrup, and salt. Set the bowl over a pot of boiling water and mix. Once the mixture has thickened, (about 5-8 minutes) start adding the butter one chunk at a time. (If you don’t have unsalted butter on hand, just eliminate the salt and use salted butter. Once the the butter is melted, remove from heat. Place the bowl inside a larger bowl filled with ice water. A nutritious lemon curd recipe using no refined sugar. Wash and dry lemons. Zest them and then juice them. Set the bowl over a pot of simmering water and stir it frequently. Once the mixture thickens (about 5-8 minutes), start adding the butter one chunk at a time. Once the butter is melted, remove the bowl and put it into a larger bowl with ice to stop the cooking. You will have zest in your lemon curd. If you would like a smoother consistency (we do), then push it through a fine mesh strainer before it cools. What about you? Do you love lemon curd? Have you made lemon curd before? Are you going to try? Previous Post Homemade Yogurt: So Easy and So Much Better For you!